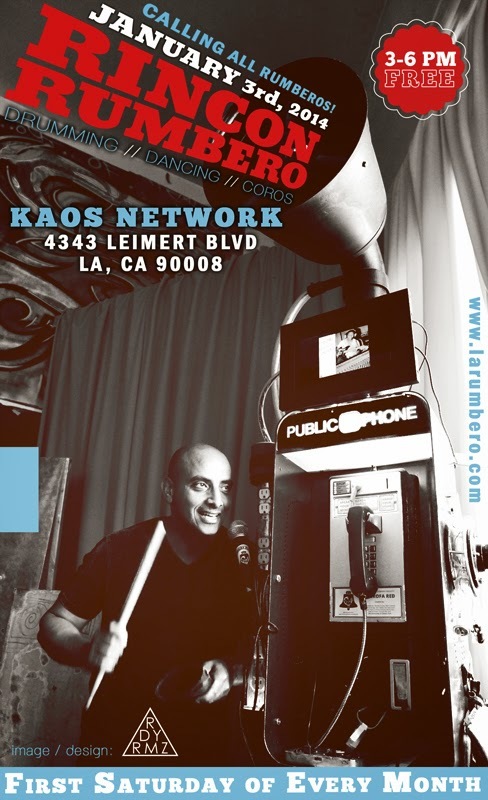 Rincon Rumbero returns for 2015 on January 3rd at the KAOS Network in Leimert Park from 3 P.M. to 6 P.M. While the rumba is going strong at Rincon into its third calendar year, one this is clearly lacking - a sense of community. For 2015, Rincon's focus will be to build community and grow the cross-section of people attending event. During Rincon's first year it was common to see families with their children attending the event. There was plenty of food as many people donated items to the potluck and the monetary collection box was plentiful - with all the funds going to support the KAOS Network which donates the space for the rumba. Over time, this dynamic eroded to the point where Rincon has been been primarily a a gathering drummers. This is not rumba. Rumba is a place for singers, dancers, and drummer to unite and display an art to the community which appreciates the music and dance. It take the cooperation of everyone who loves the art form to make rumba come to life. It is a true community. We want to build our community once again and invite everyone out on Saturday, January 3rd. Bring yourself, along with your loved ones. If possible bring a small item for the potluck. Most importantly, bring your love for rumba.